I dag har vi nået en særlig milepæl, så vi troede, vi ville benytte lejligheden til at dele med dig nogle statistikker om projektet (det er også næsten præcis 1 år siden vores sidste officielle udgivelse, så statistikker om de seneste 12 måneder er let at beregne ). Vi vil gerne takke alle vores spillere og fans, der har gjort disse statistikker så imponerende. Dette indlæg blev udgivet i Nyheder. Bogmærke den permalink. You did a very very good work in this mod game. Better than the original ! Thank you for the work ! Thank you ! There are also many asia players. Yes, China is 11th and Vietnam 14th 🙂 And there’s probably a lot more players who don’t visit our website but get download links from friends. Very Good 😀 thanks for everything you’ve done ! i’m a Chinese my dad bought me a real copy of this game when I was 7 yrs old. i’ve been playing and loving this game. i will donate when i’m rich! gj guys , keep it !! Congratulations and thank you for bringing this classic game to a state it truly deserved. If you’re planning to update KAM Remake, please consider reworking siege equipment or surprise us with any other new content. And where is Spain in the top? I was just wondering this when playing on an Ipad, what if there was a KaM game as app. The game has controls that are easy to control with only your fingers, only problem you might encounter is with moving your soldiers, and doing so quickly. Also not sure if when you have actually made the application, how you will offer it. Ofcourse the game itself is the original KaM so you can’t ask a price for that but for free, no profit. Anyways think about it and if you need help on thinking how to make it or do certain things to make the app succesful, please ask. Unfortunately there are many technical and legal reasons why an iPad/Android tablet port of the game would be difficult. I don’t think it will happen any time soon. Dankjewel voor deze remake. Heb jullie website gevonden en ben nu de mod aan het installeren. Jammer dat de developers van het orginele spel het hebben laten vallen. Respect dat jullie dit oppikken. Misschien is het ook wel het beste dat ze er zelf niet aan verder werken want als het populair is word het geld voorop gesteld. Kijk maar naar Dragon age II als voorbeeld. Nu ga ik het proberen en zal feedback geven. Hopelijk hebben jullie er een pauze knop opgezet. Dit ontbrak wel aan het echte spel. joey je heb helemaal gelijk, dit is heel mooi, jammer dat het oude het heb laten vallen ja… speel dit spel al vanaf mijn 8e en ik ben nu 18:) dit remake is veel mooier qua graphics. er zijn veel nieuwe dingen bij en het is allemaal veel leuker en beter, ik heb de makers al een mail gestuurd wanneer er een update kom voor kam remake. dat zal echt top wezen! groetjes van een trouwe en liefhebbende kam speler! joey, you have absolutely right, this is very nice, too bad that the old have it drop yeah … playing this game since I was 8 and I am now 18 🙂 This remake is much nicer in terms of graphics. there are many new things and it’s all much more fun and better, I have the developers sent an email when there is an update coming for comb remake. that will truly top being! greetings from a faithful and loving comb player! Thanks for the great work, from Hungary! It’s not gonna be just a patch :D. It’s gonna be a new release, with a lot of bug fixes and new features :). There’s gonna be a feature, to send a map you want in lobby, so you could easily send Iceline to your friends if you want :). One of the reasons why some maps are removed, is that there were too many of them, so it could’ve been confusing for new players what to choose. This is why I said that. : ) Iceline is a totally cool, tactical 3v3 map. Also I can agree, there are bunch of others, that should be removed. Thank you will continue down this game, and demonstrating new vitality! Thank you for your contribution to the game of culture! Especially, you have to enter the Chinese players server to communicate with Chinese players and the culture of the game. Na przyszłość używaj proszę języka angielskiego jeśli możesz, żeby ułatwić komunikację, to jest najbardziej uniwersalny język :). Nowa wersja powinna być gotowa za 2-3 miesiące, obecnie trwają testy, co jeszcze trochę potrwa. Hello!!! So happy when my friend said, the KAM it’s alive! And is better than past version! Congratulations to all people make this for real.. was a dream, became real… Is fantastic, remind me to childhood!!!!! I have a question: Argentina (country) where is in the top list? Can’t wait to publish this to all people i know….!!! Chao! 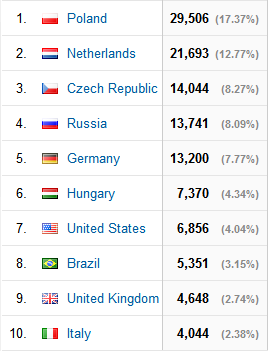 Numbers fluctuate from month to month, but on average, Argentine is on 21st place with 0.85% visits. This was one of first games I ever played on my first computer. Been in love with it since. I was so happy to find it alive that I immediately purchased original copy from gog and started playing. I am from India. Where is India in the list?? Srsly, when i saw that website i thought that is a fake or something like that. Now i am really shcoedk about that K&M are still alive. Thanks to you guys and community! Well done! yes this is really so beautiful! reborn! Gem mit navn, e-mail, og hjemmeside i denne browser til næste gang jeg kommentere.